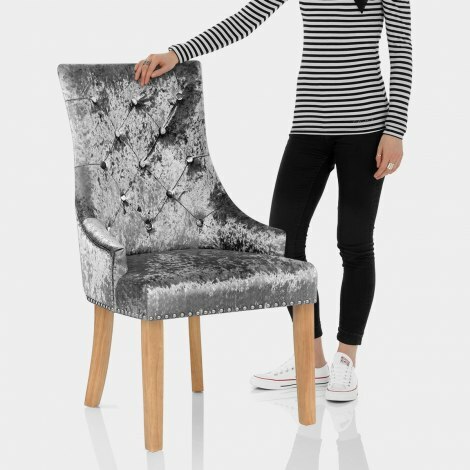 For a luxurious addition to your dining area, the Ascot Oak Dining Chair Grey Velvet has elegant and exclusive style and is not to be missed. Now with new and updated grey velvet for October 2018. 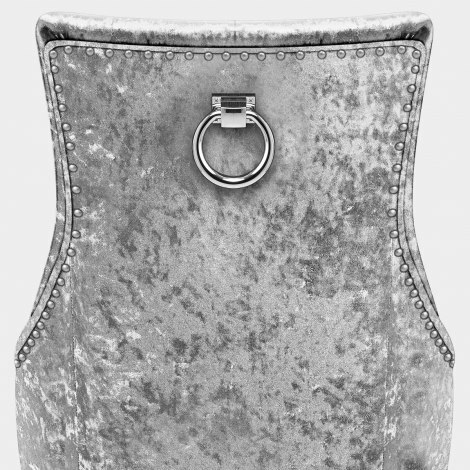 Fashionable crushed grey velvet lends a sense of opulence and a full webbed seat pad ensures first-class comfort. Quilted button detailing on the high backrest adds to the grand design, whilst decorative chrome studs edge the seat for lavish effect. A tasteful chrome ring on the rear of the seat makes for a stylish feature and delivers a unique look set to impress. Four solid wood legs create a strong and stable base, and the polished oak finish gives a classic look that compliments the grey velvet. With protective floor plugs, the Ascot Oak Dining Chair will compliment a variety of interior settings.